Hey Taylor, You don’t know me but I’m Emily. I have been a fan since my early teens when I heard love story on the radio but didn’t see you perform live until the RED tour. We had nose bleed tickets but it was amazing, as soon as you came on stage I cried because I was so overwhelmed, the mean speech really touched me. I now know that I am never alone in what I am feeling and whenever I feel alone I turn to your music and remember that Im not. 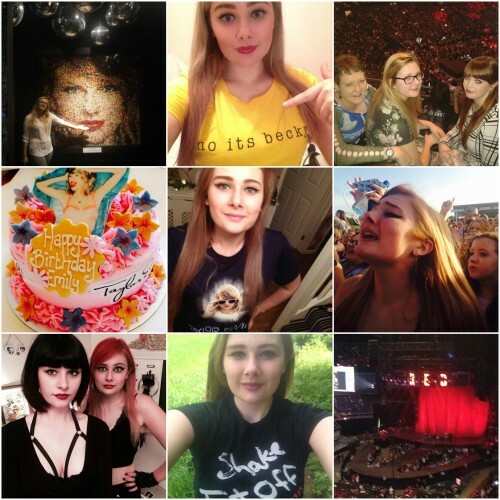 The RED tour honestly changed my outlook on life, and I will never forget it. I saw you at hyde park and Sierra upgraded our tickets to diamond view and it was the most amazing day of my life. The second you came out I cried and I didn’t stop, I will never forget that day and I will never forget you! You have taught me so many things and I will hold them close forever. I feel like since 1989 came out (and since I joined Tumblr and read your advice) I have become so much stronger, I used to get upset about things that people would mindlessly say and now I don’t even care, I know that their opinions do not define me. Like you say people change and I want you to know that I have changed and grown stronger every single day since you released 1989 and thats thanks to you. I cant wait for TS6 so I can learn even more lessons and grow even more stronger because of you!!! !